Above: Image from The Precession. Photograph by John W. Sisson Jr. The Precession, a project of Judd Morrissey and Mark Jeffery with Claire Ashley, constructs a performance, installation and an 80-foot internet projection of visual poetics and movement combining writing, text-mining and processing, the real-time positions of celestial objects, and depictions of the laboring body. The Precession: AN 80-FOOT-LONG INTERNET ART PERFORMANCE POEM is a 3-hour durational digital literary / visual performance art work in 10 parts. Each part lasts between 9–18 minutes. This durational event extends and activates The Precession, via a systematic orchestration of live elements within the Arizona State University Art Museum. 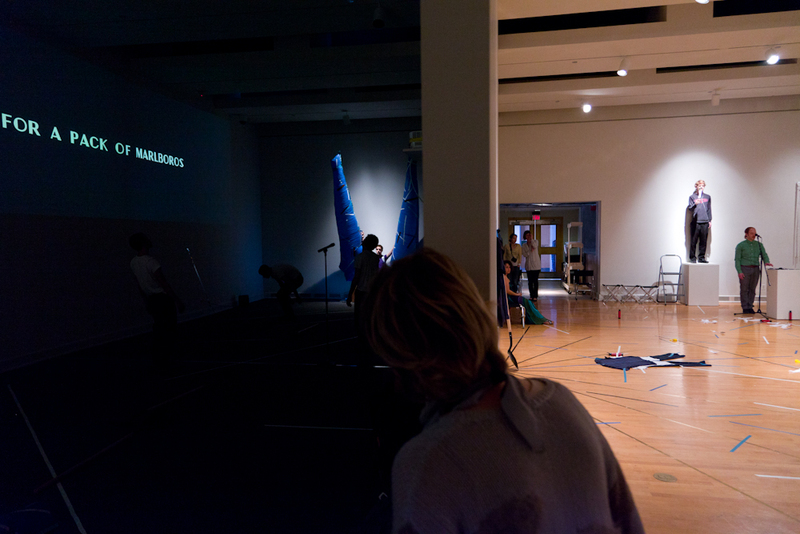 Performance components include choreographed readings of texts being generated on ASU Art Museum gallery walls, a Busby-Berkeley inspired movement sequence mixing gestures of labor with embodied formations based on the stars above the building, and live and screen-based responses to works by Sol LeWitt (the sun) and Rebecca Horn (the horned moon). A chorus will sing a song, an incoming stream of Twitter texts, and excerpts from the source code of The Precession. Visitors may enter or leave at any point. The Precession began with an accidental road trip to the Hoover Dam in Nevada in January of 2008 and the discovery of the Works Progress Administration sculpture The Winged Figures of the Republic. We began to look at this public sculpture in residence and presented a work in progress presentation at Firehouse 13, Providence, Rhode Island on the Spring Equinox in 2009. The work has since developed through a 6-month residency at Hyde Park Art Centre throughout 2010, a month long Residency in Performance Writing at Dartington College of Arts, UK in summer 2009, and two residencies at Catwalk Art Residency, NY. Additional exhibits and presentations have taken place at PSi 15 Zagreb, MCA Chicago, Chicago Dancemakers Forum, post_moot, poetry + performance convocation at Miami University in Ohio, ELO_ AI at Brown University, NOISE! 2010 at the Ontological Theatre NYC, and Radical Citizenship: The Tutorials organized by the Anhoek School on Governor’s Island in NYC and Southern Exposure in San Francisco. Judd Morrissey and Mark Jeffery have presented throughout the US, UK and Europe, with recent venues including Lincoln Cathedral Quarter (UK commissioned performance distributed throughout multiple outdoor sites), Hyde Park Art Center (Chicago), Museum of Contemporary Art Chicago, Center of Contemporary Culture Barcelona, Bergen Art Museum, House of World Cultures Berlin, Chicago Cultural Center and the Ontological-Hysteric Theater in NYC. Both artists teach at the School of the Art Institute of Chicago and were members of the seminal international performance collective Goat Island. This visiting artist residency is supported by the School of Art, Intermedia, Graduate and Professional Student Association (GPSA), Live Art Club, and the ASU Art Museum, all within ASU’s Herberger Institute for Design and the Arts. 7 pm: Live Art Platform. 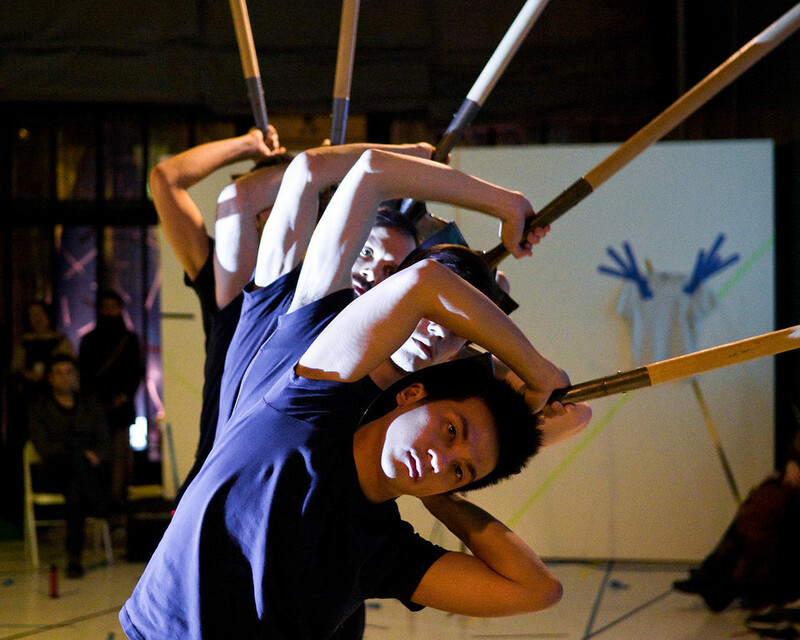 Pieces from performance workshop will also be presented at LAP. Workshop, lecture, and Live Art Platform all take place at the ASU Performing and Media Arts Center, Suite 127 (University and Rural). The talk and workshop are free, and so is parking. All images by John W. Sisson Jr.